Mull this over: 85 percent of the world population depends on plants for medicine.1 By a vast majority, most people in the world have never, ever seen a conventional Western doctor or taken conventional medicine or prescription drugs. Yet the population of the world continues to explode. When I typed that period it was 7,497,209,850. In shorthand that’s like 7.4 billion. Now, of course, most Americans have certainly seen a conventional doctor and as insurance coverage unfortunately expands, most Americans are making a habit of seeing a doctor. Now ponder this: The United States is mired near or at the bottom of every metric for healthcare or medical outcome — except, of course, cost. Infant mortality? We’re at #57, behind Slovakia, Malta, South Korea (11th) and Iceland (3rd).2 Our life expectancy? Going down while the rest of the world’s is going up!3 We don’t have much to brag about when it comes to our form of medicine. Maybe that’s why Americans are serious about alternatives to what we’re being force-fed. Maybe that’s why we need more opportunities to turn our backs on conventional therapies and look more to the traditional medicine that keeps most of the rest of the world healthy and alive. In the Beginning. When Adam and Eve were dropped into the Garden of Eden, the Creator had one admonishment: “Do not eat from the Tree of Knowledge.” Assyriologists and biblical scholars debate the allegorical meaning of the Scripture but it can be looked at very simply. “Don’t think you know more than I do,” said God. 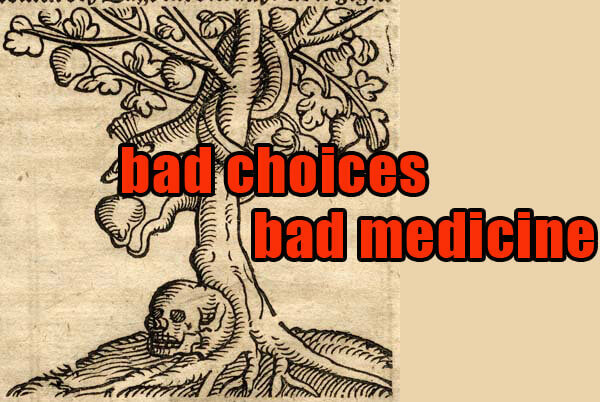 Or maybe look at it as, “Don’t think you humans know better than Nature does when it comes to healing and health.” But modern medicine is a perfect example of dining fully from the Tree of Knowledge. Reductionist science is the habit of taking something that works by natural principles and then trying to “figure it out” so that we can reduce it to what scientists, in their hubris, call the “active ingredient.” Here’s an example: Oranges contain vitamin C so scientists figure synthesizing vitamin C was a good idea. It wasn’t until years later that we realized that the bioflavonoids contained in the whole orange helped to make the vitamin C available to the body. That’s the idea behind getting our nutrients from whole foods instead of tablets. The same process is brought to the field of medicine. An example: People have known the medicinal value of Cannabis for millennia. So what does modern science do? It seeks to reduce and refine the plant to what science thinks is the only part of the plant that is needed for healing. This process of reductionist science is repeated time and time again. What makes us think that we know better than Nature other than our own human arrogance? Manipulating Nature rather than working with Nature is the ultimate ego-trip for our modern civilization. Nature did a good job of putting things together in a workable fashion and we sit around tearing things apart thinking that we can do a better job. The ultimate is getting down to the genetic level and twisting and tweaking the genome and rationalizing that we know better. And the reason we think we know better is because we’ve been gorging on the Tree of Knowledge for way too long. Natural Healing. Of course humans need not wander around nibbling on tree bark and plant roots without any kind of processing in order to use them for healing. But deviating from the common sense of Nature, failing to respect the way Nature has put things together and observing the logic of Nature is what results in failed medicine. We have the stats to prove it. The further we get away from Natural methods, the further we get from truly enhancing health and gravitate toward trying to enforce healing. It doesn’t work that way and it’s increasingly obvious when we compare our “hyper-advanced” Western medical outcomes to those of other cultures. This coming weekend, the Omaha Health Expo will at least offer the opportunity for the public to learn about some of these more natural healing modalities. Traditional healing therapies work with Nature and don’t necessarily try to bend Nature to our will. Come back to Nature. Come to the Omaha Health Expo. It’s free, just like the Fruit in the Garden of Eden. And when I typed that period, the population of the planet had grown to 7,497,359,365. Heartland Healing is a metaphysically based polemic describing alternatives to conventional methods of healing the body, mind and planet. It is provided as information and entertainment, certainly not medical advice. Important to remember and pass on to others: for a weekly dose of Heartland Healing, visit HeartlandHealing.com. and like us on Facebook.